The former girlfriend accusing DFL Congressman Keith Ellison of physical abuse said she never intended for the public to know about an alleged video that captured the abuse and she doesn't plan to release it. The video and what it shows has become a focal point as Ellison tries to refute a single incident of alleged domestic abuse just one day before a critical election. Ellison has denied the accusation and says no video exists. Karen Monahan, Ellison's former girlfriend, says there is video, but for several reasons, she won't make it public. "It's humiliating, it's traumatizing, for everyone's family involved, and for me," she said in an interview with MPR News on Monday. She said she's also frustrated that people won't believe that she was assaulted unless she produces the video. "It sets the expectation for survivors of all kinds of forms of abuse, whether it be abuse toward women, abuse from police officers, abuse from other people in power, to have to be the ones, like I'm doing right now, to show and prove their stories," she said. "It's feeding into that." The allegations were first circulated by Monahan's son in a Facebook post Saturday night without her knowledge beforehand, she said. Since then, the allegations have exploded on social media and have become an issue in the race for attorney general, where Ellison has been the perceived front-runner in a five-way DFL primary. The election is on Tuesday. Ellison is firm in his rebuttal of the alleged incident and the existence of the video. "This video does not exist because I never behaved in this way, and any characterization otherwise is false," he said in a statement Sunday. Monahan also sent additional text messages to MPR News indicating that she alerted Ellison to a video in December 2017. "We never discussed — the video I have of you trying to drag me off the bed," Monahan wrote to Ellison, quoting abusive language he allegedly shouted at her. Ellison did not respond to that message or several that followed. Monahan said the recording also came up in a meeting with Ellison one day before he filed to run for attorney general. Monahan said Ellison was concerned about their text message exchanges and her increasingly frequent social media posts alluding to their relationship. "He said it could ruin his career. I said 'Keith, I'm not the one who is ruining your career. You're the one that chose to put your hands on me. You're the one who chose to drag me off the bed. You're the one who chose to gaslight me and manipulate me.'" "He said, 'Let me see the video.'" She didn't show it to him. In a statement to MPR News, Ellison's campaign manager Ryan Doyle said Monahan requested to meet with Ellison before he announced his run for attorney general. 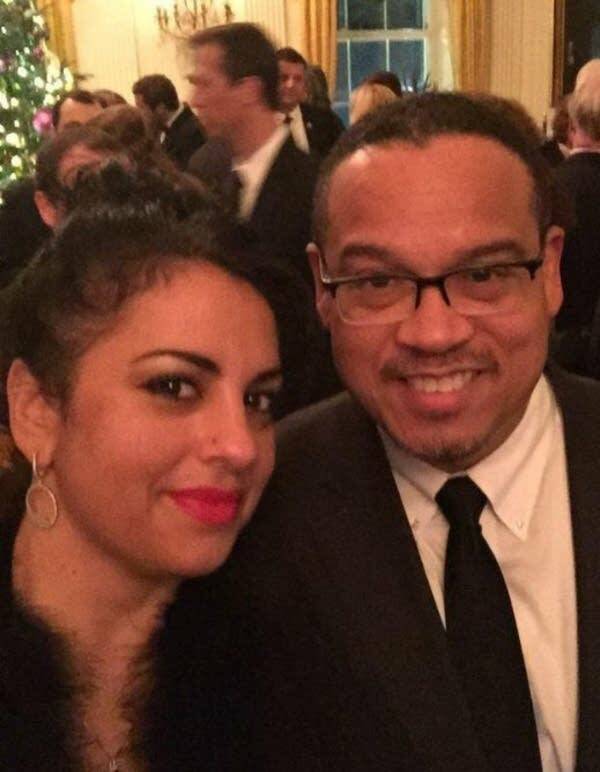 "After their relationship ended in 2016, Congressman Ellison met with Ms. Monahan numerous times at her request, including the night before he announced his run for attorney general, when she asked for a meeting to request assistance and advice for a mutual friend," Doyle wrote. "In that meeting, Ms. Monahan repeated her false assertion that a video exists." 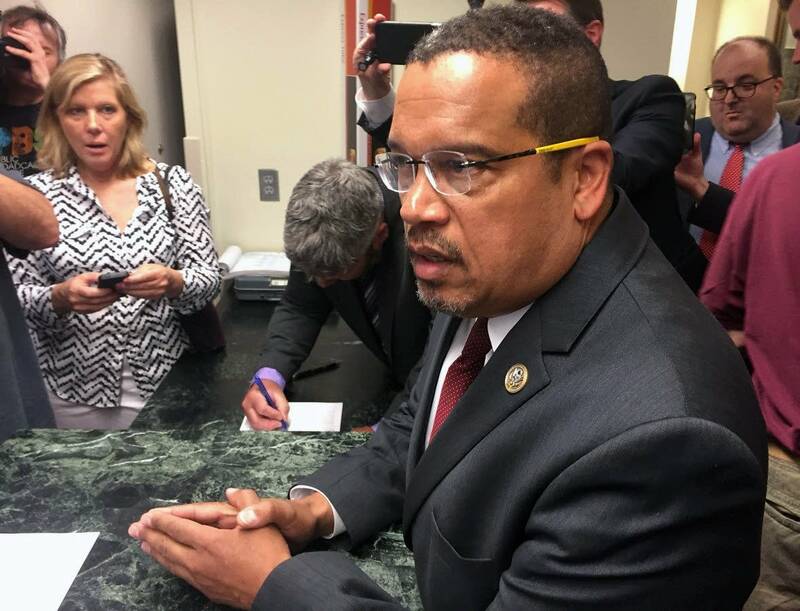 The alleged incident captured on video happened at Ellison's Minneapolis home. In Monahan's telling the couple had a verbal confrontation, so she slept in a guest bedroom. The next morning she said she was listening to a podcast on her phone when Ellison came into the room, asked her to take out the garbage before he left town, and grew upset when she ignored him. Then, according to Monahan, he pulled her from the bed by an ankle and shouted profanities at her. She says she recorded it on her phone, which she was holding at the time. Julie Owens, a consultant who works with domestic abuse survivors and groups based in North Carolina, said it's not unusual for a victim of abuse to not want video of the assault released. "When I have worked with victims where those things have become public it's been very hard for them and it has been retraumatizing," she said, adding "I do think that asking a victim to produce proof of abuse is rather abusive in and of itself, although I understand people want to know what the truth is, obviously." Monahan said she has never been contacted by any candidate or campaign in the attorney general's race, and she didn't intend for this to be an issue in the election. She said she's not asking Ellison to leave office or step down from the race for attorney general. "It's never a good time, whether I came out now or came out during a general election. It's never going to be the 'right time,'" she said. Ellison hasn't spoken publicly or held any open campaign events since the allegation surfaced. More than 115,000 votes had already been cast via absentee ballots by Monday morning. It's too late for those voters to now change their selection. "I've had people talk about and message me their survivor story and how they felt validated when I came out," Monahan added. "That's the same thing I felt when other people came out, and that was one of the main points of me coming out and talking about my story."